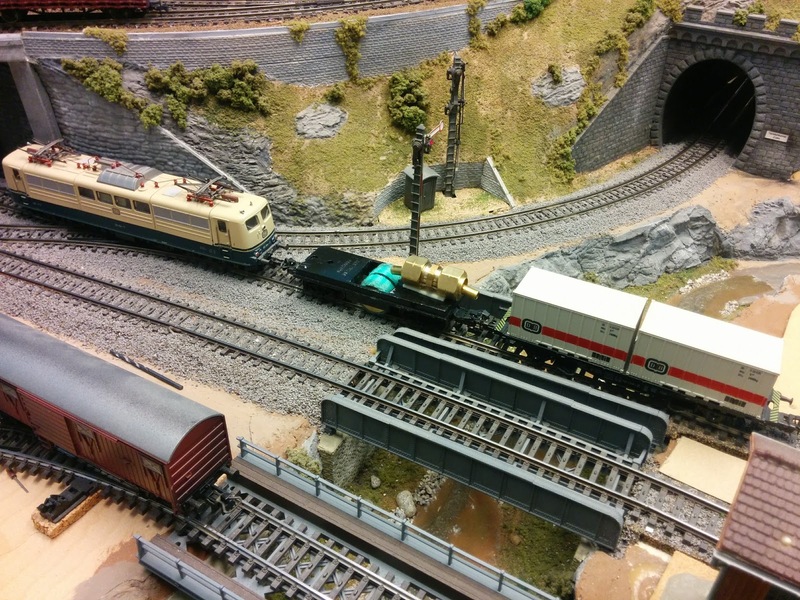 When I planned the passenger trains for my Welztalbahn to connect Stuttgart to Freiburg via Freudenstadt and Hausach, I had no idea that there actually used to be through passenger trains operating this route from Stuttgart all the way to Hausach and back. My schedule book (Kursbuch) from 1978 does not have this route, and the best connection requires passengers to transfer between trains in Eutingen, so I have no idea when this was route operated. I've been following Tony Thompson's blog "Modeling the SP" for a couple years and I've referenced it a couple times from this blog. 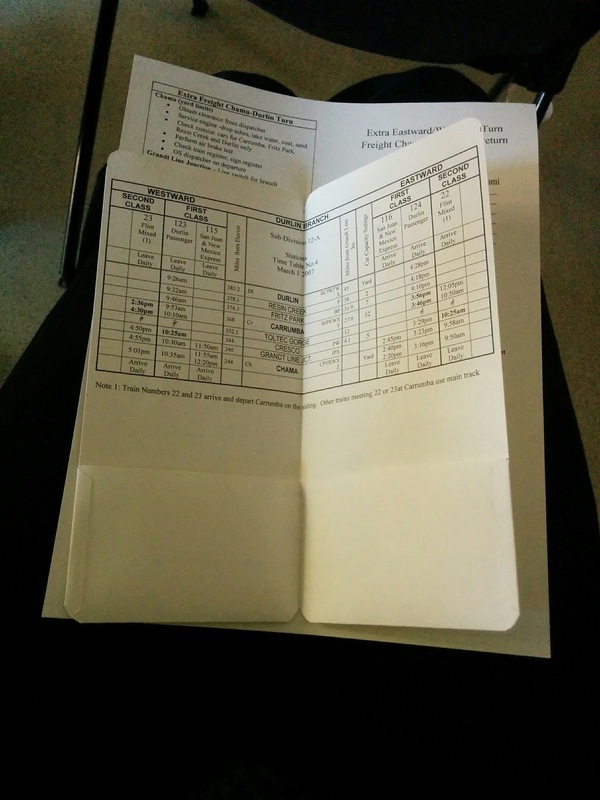 It was great to experience the layout and Tony's flavor of prototype paperwork in an operations session today. I was paired with an knowledgeable operator and off we went. 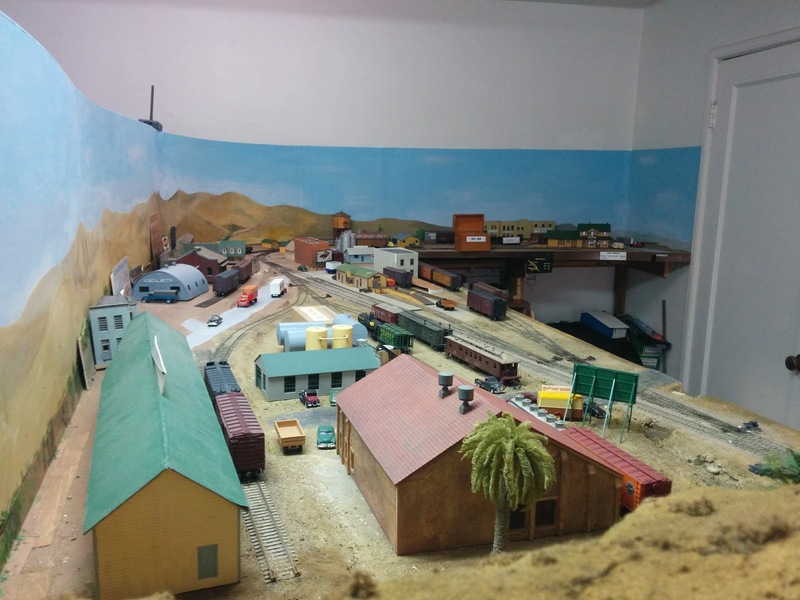 The layout atmosphere is decidedly 1950's California with palm trees, the Southern Pacific, and lots of era- and location-appropriate details. 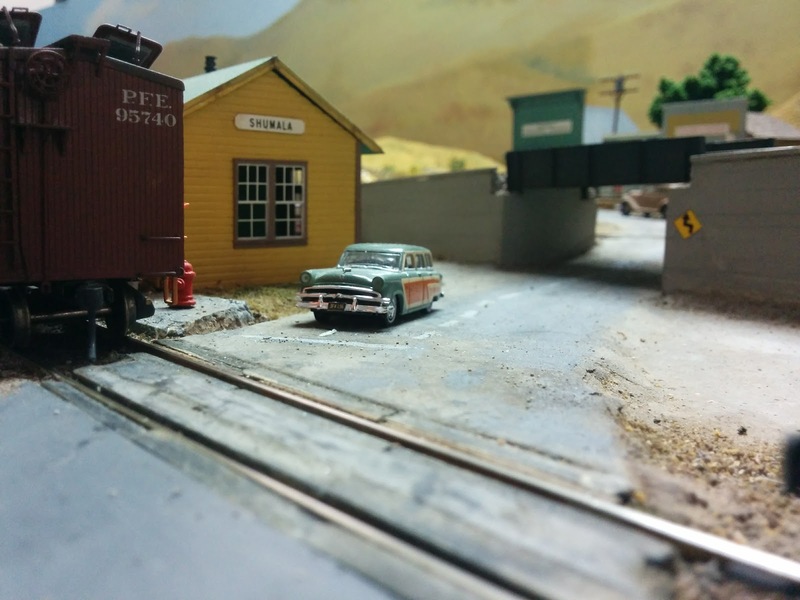 This team started out on the Ballard side of the layout with the local having just arrived in front of the depot in Ballard. For the next 1 1/2 hours we were busy switching Ballard and taking a trip down the branch to Santa Rosalia. Thick oil hoses for unloading tank cars, made from wire. 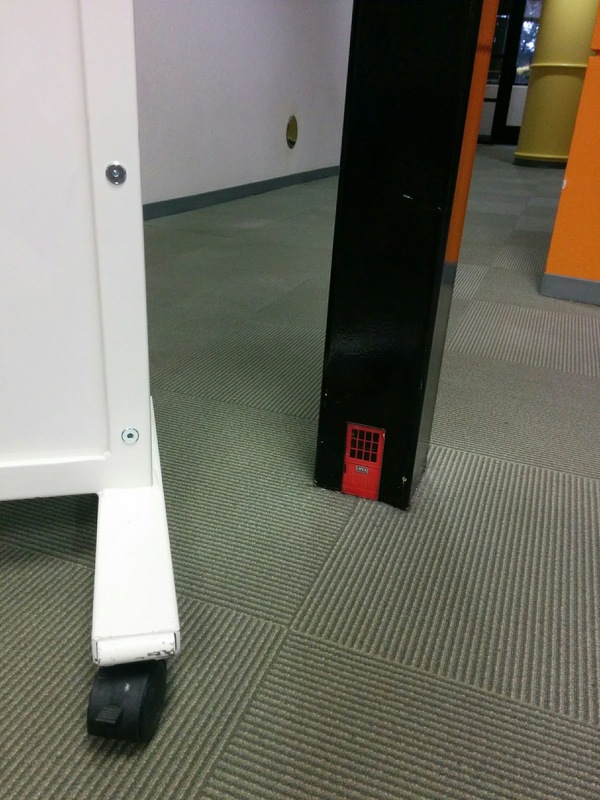 Simple, yet effective. We were early on our return trip to Shumala, and waited at yard limits until the team switching in Shumala was ready to take us in. "Let's go to the cafe on Chamisal Road. I hear they have a good lunch menu." Shumala is on the Pacific Coast main line which runs on a bluff right next to the Pacific Ocean. Tony has captured that scene nicely with the MOW house high up on the cliff. I can almost hear the seals barking on the beach. 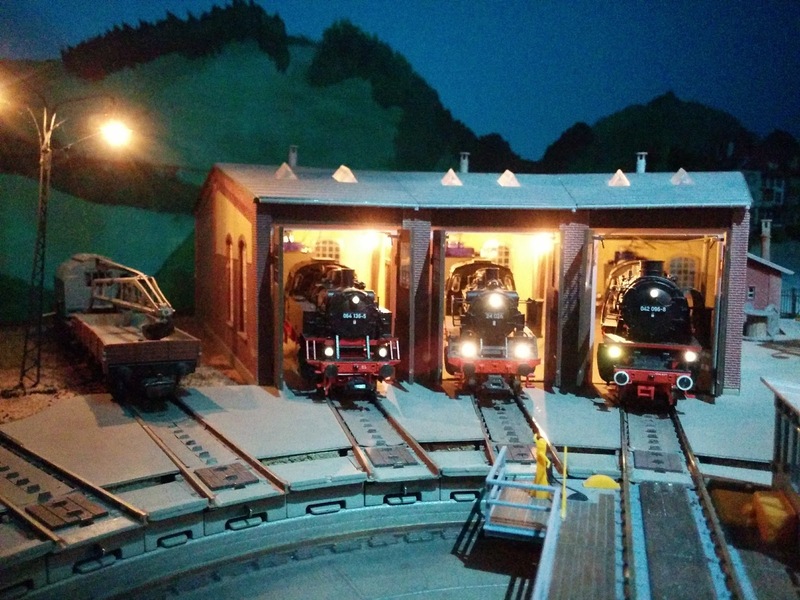 I love how Tony has incorporated vignettes like this on the layout to create a feeling of place. After the other team had left Shumala we go to work on our part of the session on the Shumala side. Throughout the day, I had a great time, and enjoyed the friendly chats, banter, and hospitality before, during, and after the session. Thank you for hosting us today, Tony. 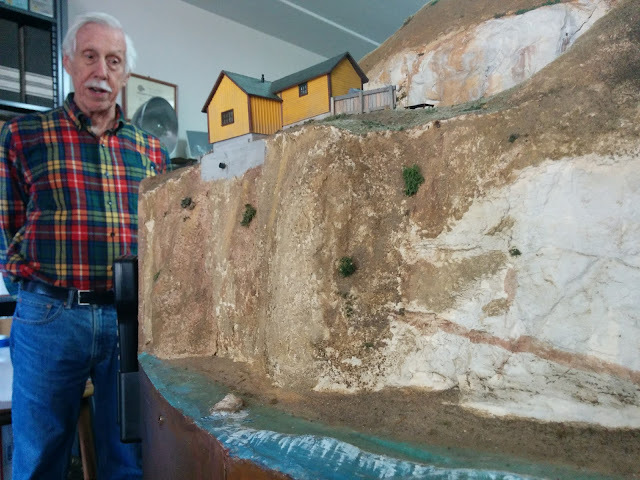 As in previous years, on the last weekend of January the Layout Design and Operations SIGs of Pacific Coast Region of the NMRA put up a small conference program complete with layout tours, presentations and operations sessions. The program this year was superb with topics from operations over layout design to a real world application of LCC. I was intrigued by the concept of train pockets mentioned in Dave Adams' talk, combining a place to keep car cards with the schedule, train instructions, and a cheat sheet to TT&TO on the reverse. Interesting. On Friday evening, Silicon Valley Lines was open for visitors and hosting an operations session. Since the yards were covered I was even able to run a train. 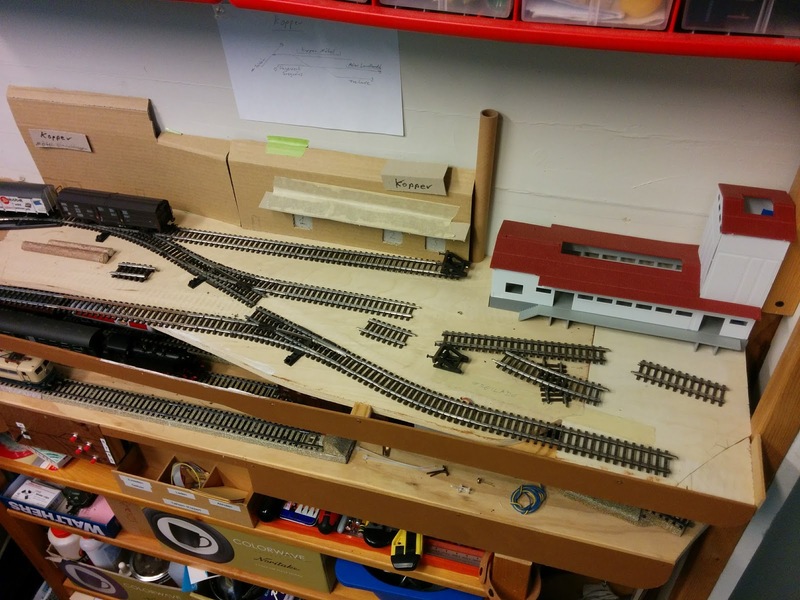 The Welztalbahn was on the layout tour Saturday evening, so I left the meet a bit early to get the layout ready. Sunday I was invited to operate on Tony Thompson's SP Santa Rosalia branch. Taking the train to the city for shopping and ice cream. 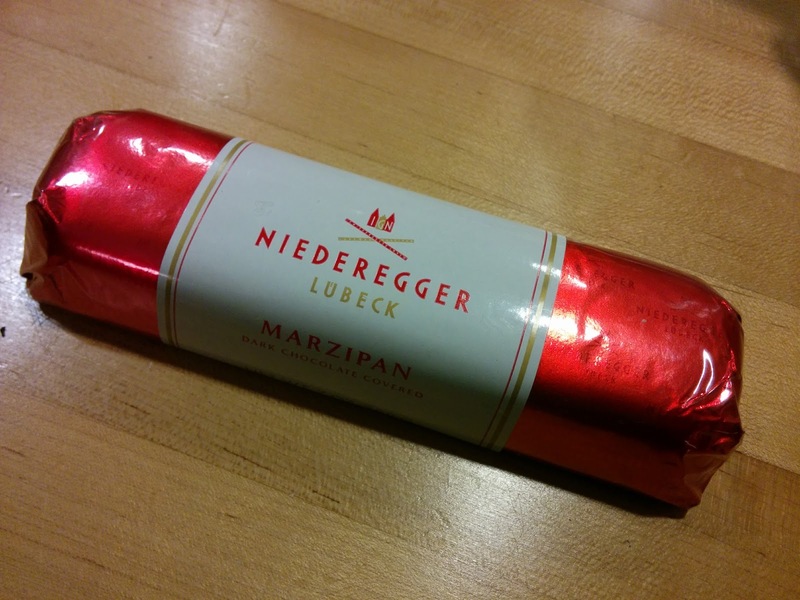 Hands-down the best marzipan, and sadly all that's left of the Christmas sweets attack. Talheim station just before the last train of the day is scheduled to arrive. 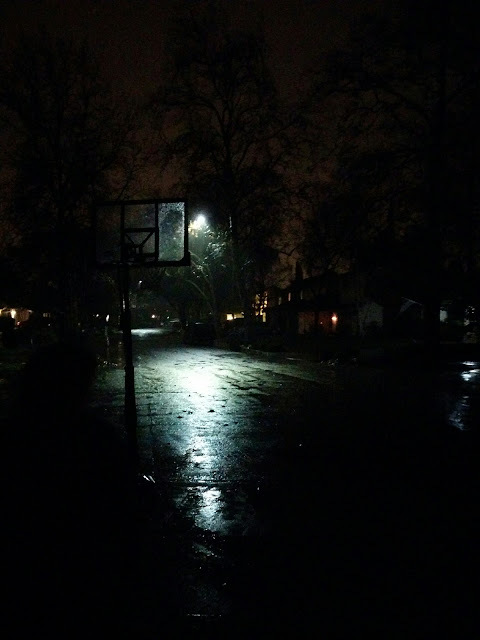 After walking the dog tonight in wind and rain to the end of the street, we decided this is not the evening for walking the dog any more than the bare minimum. I'm experimenting with making car cards that closely resemble actual prototype paperwork. It turns out that I can replicate the look and feel in the roughly 2.5 x 2.75 inch space I have available. The plastic sleeve has information pertinent to the car as explained in a post from last week. Additional sheets stacked in the sleeve represent the paperwork attached to the freight car ("Hauptzettel"), which was used by the switching crews to determine where a car is going. There was a large number of variations of Hauptzettels based on the kind of freight, purpose, and urgency. I'm missing a few bits of information for my railroad (primarily schedule and train numbers) to completely fill in the required information. Since I have been unable to find a table linking the various yards and freight stations in Germany to their respective routing number ("Richteinheit") for now I'm trying to make up somewhat plausible numbers as I go. 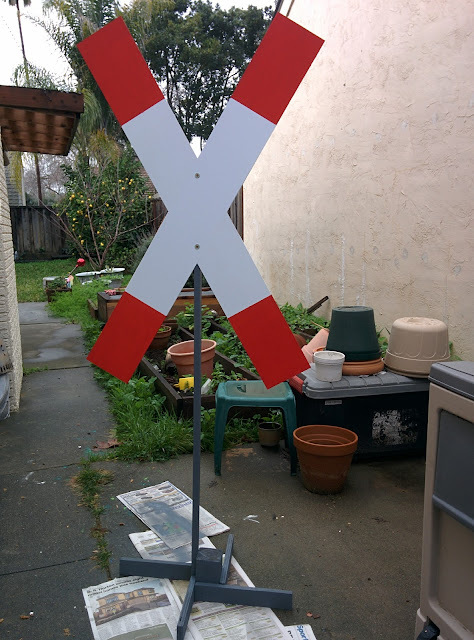 This is primarily relevant for cars coming from or going to towns beyond the boundaries of the modeled railroad. Cars coming from elsewhere will have a Hauptzettel with the closest yard or major freight station, while paperwork of cars leaving the modeled railroad will be coded for the yard closest to the destination. I made some blank Hauptzettels first, and then went all in. To keep some sanity I'm preplanning car movements across the layout, similarly to how fully filled-in 4-cycle car cards are pre-planned. 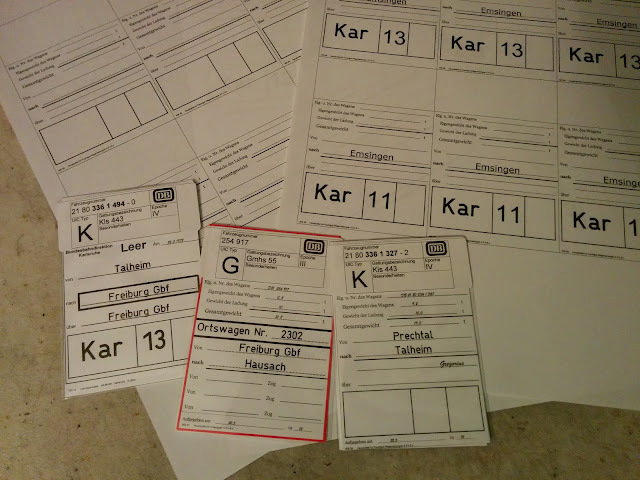 However, instead of filling out one half of a 4-cycle car card I make the respective Hauptzettel. 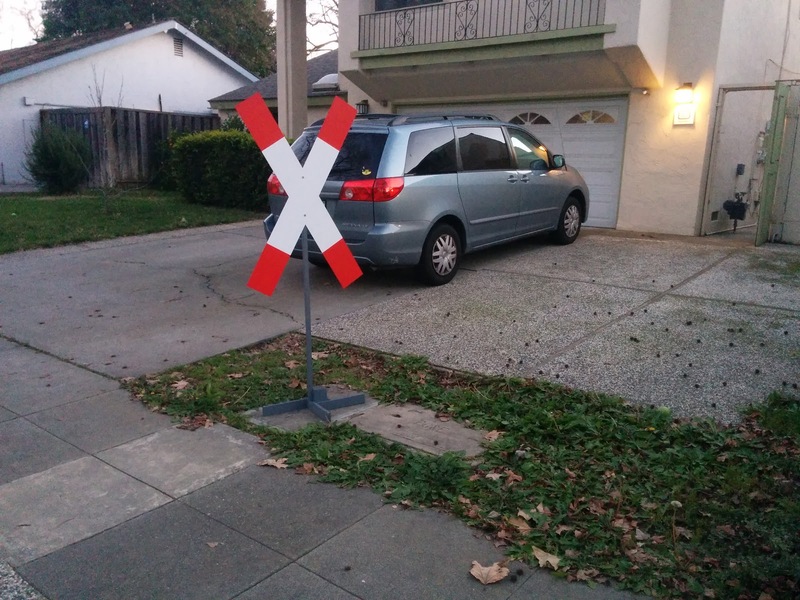 The first sequence is for car 21 80 336 1 494, a flat car with stakes, DB type Kls 443. The model of this car is loaded with timber. 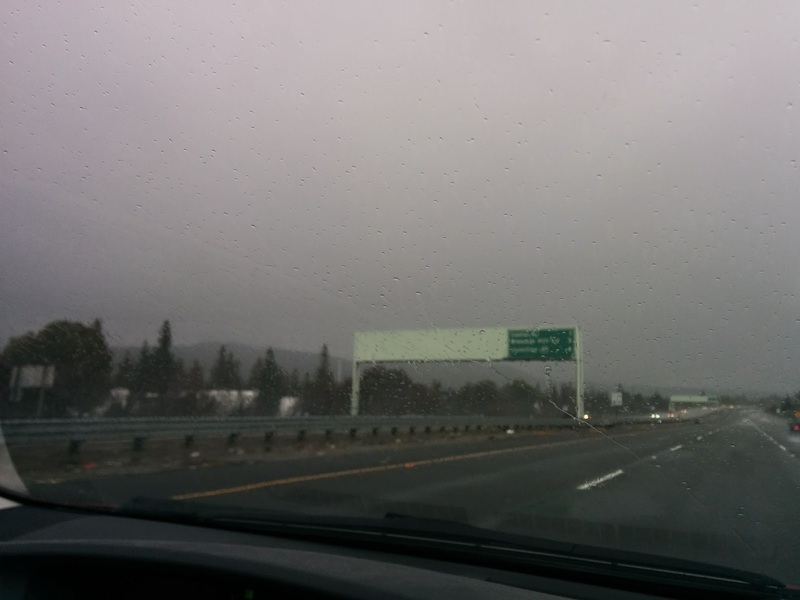 The sequence for this car is shown in the photo in the row at the top. The car starts loaded on a local transfer freight in Prechtal staging and is delivered to Emsingen. The routing calls for sending it to Talheim. Emsingen is not a yard, Talheim is one town over, so I didn't put a Richteinheit-Code on the Hauptzettel. I don't know if that would have prototype practice, or if they had labeled for the closest yard and then maybe send the car there, just to get it back a day later, or put the car right on the next local transfer to Talheim, since it's obvious where it's supposed to go. Note that Hauptzettel in the 60's and 70's only include the destination station, not the sender or receiver of the freight. That information is included in the waybill traveling with the conductor. Local rules and practices at the destination station usually determined where to deliver a specific car. I'm simulating this by adding a "handwritten" note to deliver the car to Gregorius, which is the sawmill in Talheim. In the next session we assume the car is unloaded, and no longer needed, so it travels as empty car ("Leer") to a nearby yard for storage. I picked Freiburg Gbf, which is near the imagined south-end of the Welztalbahn. 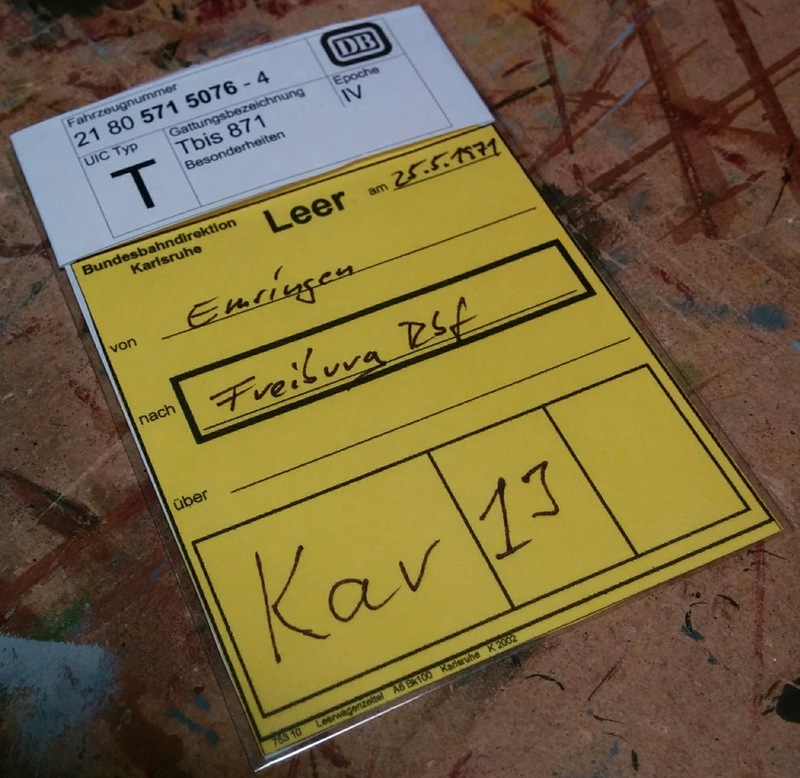 This implies that the car will be picked up at the sawmill by a local transfer run to Emsingen, where a southbound local freight will take it to Freiburg. 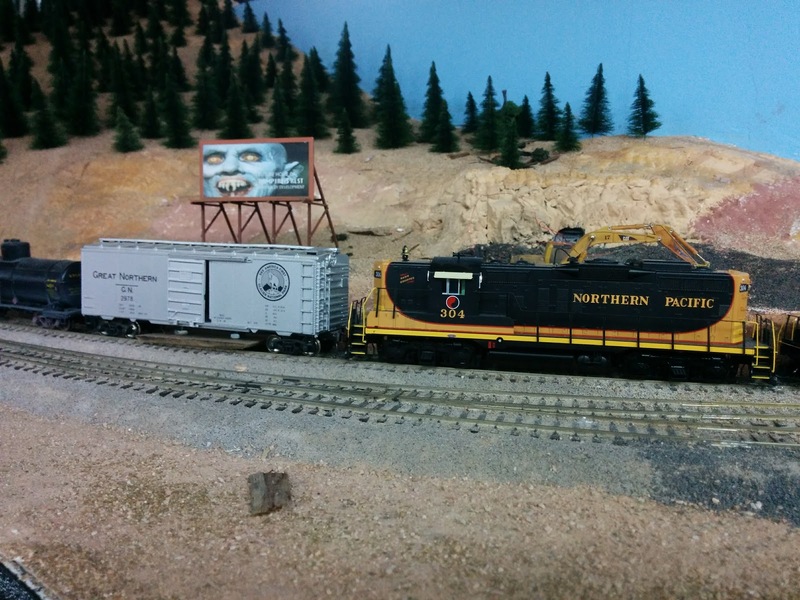 How do we know that the car needs to go on the southbound freight, and not the northbound freight? We're in the Black Forest which belongs to the regional railroad office in Karlsruhe ("Bundesbahndirektion Karlsruhe"). 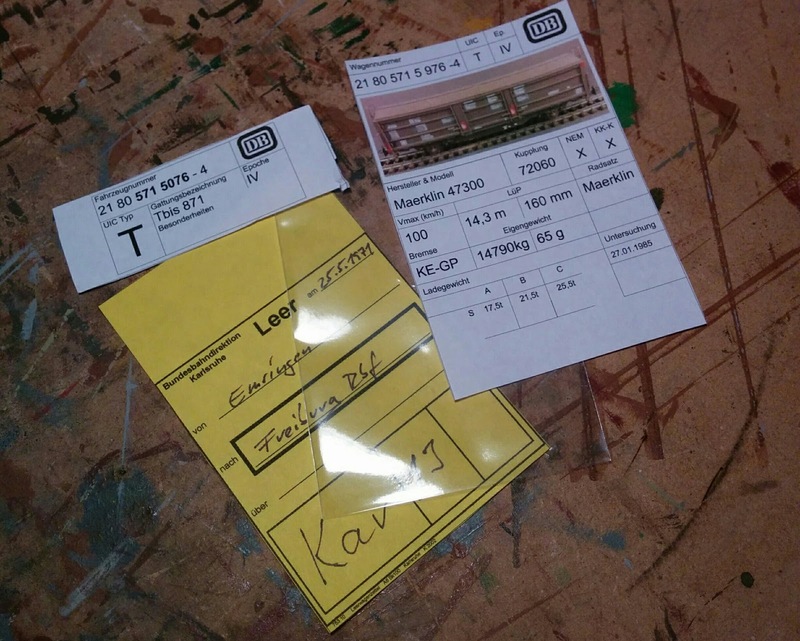 The Richteinheit Code for all yards and major freight stations in the region starts with "Kar", followed by a sequence number that roughly identifies the area. Since all major freight exchange points in the region are in the Rhine valley, I assume that Karlsruhe numbered their Richteinheiten from north to south along the Rhine. The switching crew in Emsingen has a cheat sheet that basically says, "Cars for Kar 12 - 15, Switzerland, and Italy go south, everything else goes north." The actual switch crews had similar tables for the various destinations across Germany. Eventually, the car ends up in Freiburg staging. Finally, in the next session it comes back, requested for loading in Prechtal. The car might have been "somewhere else" in the meantime. Since Freiburg is the closest yard for cars inbound to the Welztalbahn from the south, the Hauptzettel is tagged for Freiburg. The car arrives in Emsingen, the local crew knows which trains goes to Prechtal, and the car is put on the next local transfer run to Prechtal staging. Now the cycle can start anew. 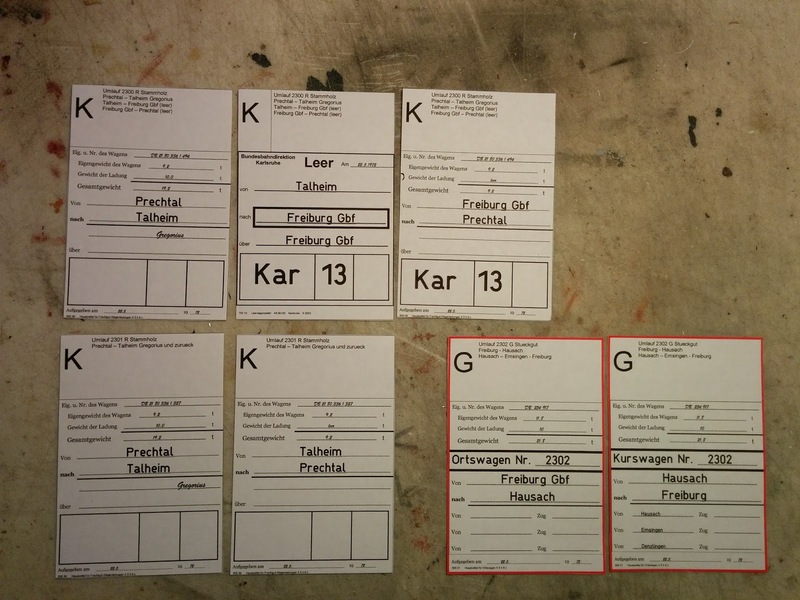 The sequence with two cards in the lower left is for car 21 80 336 1 327, also type Kls 443, but this car merely bounces back and forth between Prechtal and Talheim. 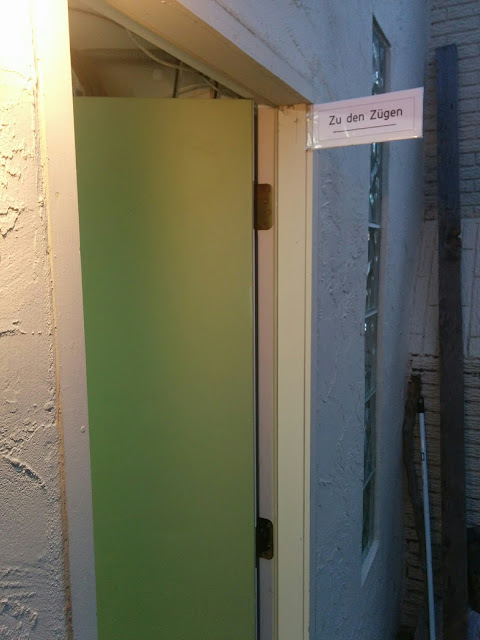 It gets a regular Hauptzettel in both directions, with a note that it's empty ("leer") when going from the sawmill to Prechtal. The third sequence is for car 254 917, a box car DB type Gmhs 55. The 's' indicates that this car may be put into trains traveling at up to 100 km/h and the 'h' indicates the car is equipped with steam heating connectors, i.e. it's feasible to put this car in passenger trains. The sequence for this car is on the lower right. This a LCL (less than carload) freight plan, indicated by the red border. 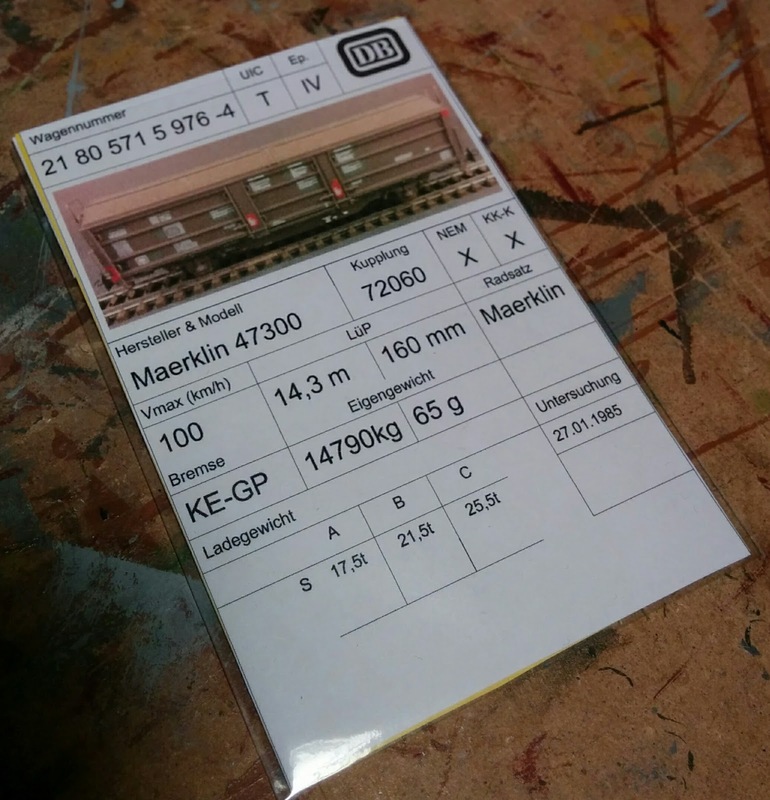 On the outbound run, the car travels on any available local freight train from Freiburg to Hausach, indicated by the lack of specified trains at the bottom of the card. On the return trip from Hausach, the car needs to be set out at specified stops. I have not built the revised schedule yet, so the rows are missing the respective train numbers. I'm thinking that the car might arrive from Hausach on the regular local freight, gets set out to the freight shed immediately, loaded/unloaded and then continues south with a local passenger train. 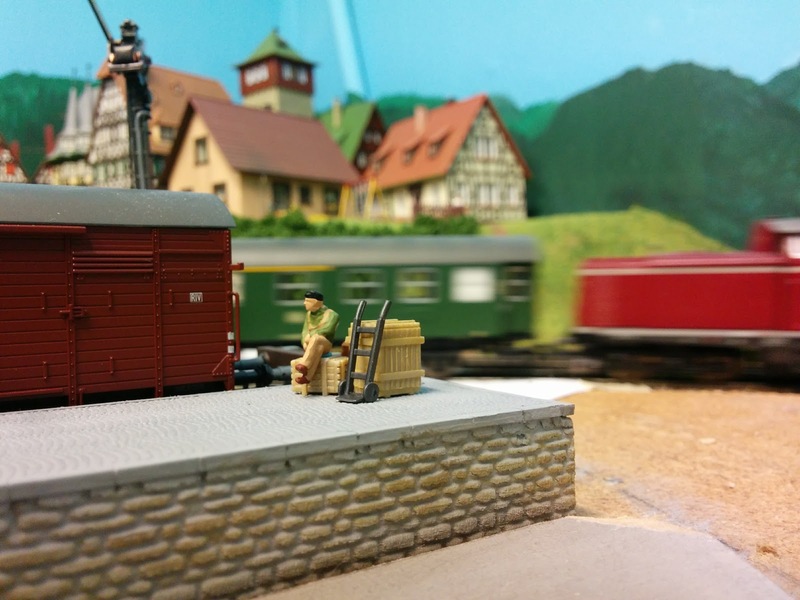 The set out in Denzlingen is already off-layout, so the passenger train will take the car to staging. This will be added to the cheat sheet. Finally, I'm likely taking some liberties in historical accuracy, as I have been unable to find a copy of the applicable rule book yet (Deutsche Bundesbahn DV 605 "Gueterbetriebsvorschriften") which explains various aspects of the process in vast detail, including samples of paperwork. Most online sources I've found focus on the 50's and 60's (Germany Epoch III). 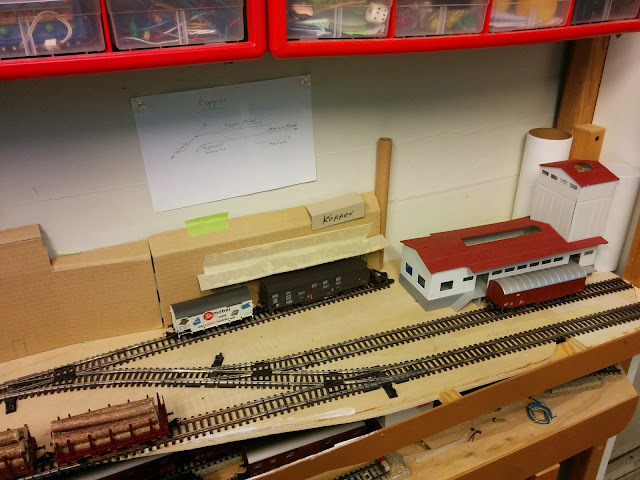 DB made substantial changes to freight operations starting in 1974, and my layout is set in 1972, so I'm reasoning that practices in the early 70's likely resembled what was done in the 60's. There are some aficionados that do something similar to what I'm trying here, but they focus on Deutsche Reichsbahn in East Germany where practices were similar in concept, but had diverged over time in implementation, so the paperwork and routing codes look a bit different, too. I got a DV 605 and have examples now. 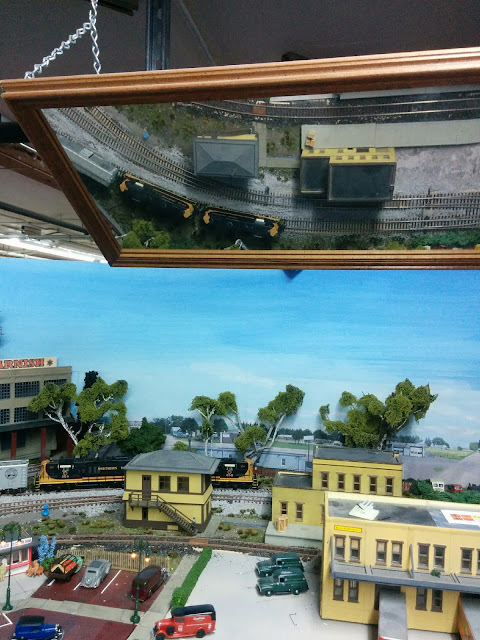 The script for automated running successfully completed a 2 hour run today with no accidents and no derailments. I call that good enough. A few mechanical issues were found along the way as expected and mostly taken care of on the spot. 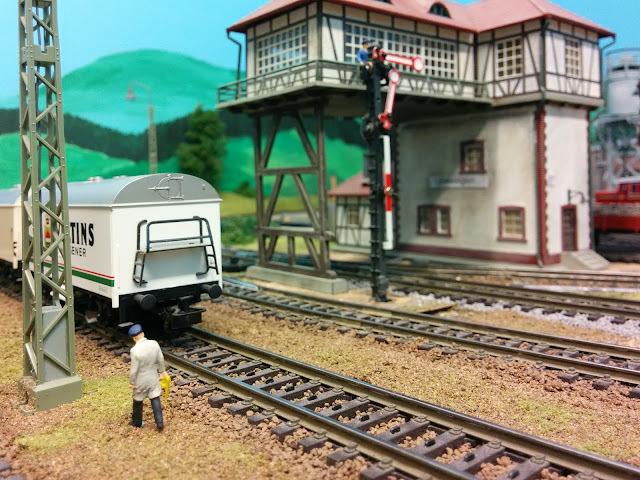 While trains were running I played with various building arrangements for Werner & Soehne. I decided pretty quickly that rectangular building shapes are not going to cut it here (contrary to earlier plans), so a more substantial kitbash of the well-known Kibri factory will be needed to fill the triangle between the two tracks serving the factory. The short wall on the right will be reduced to only two columns so that the building can slide closer to the turnout. The cut-off column will be used to fill the gap between the other short wall and the administration tower. 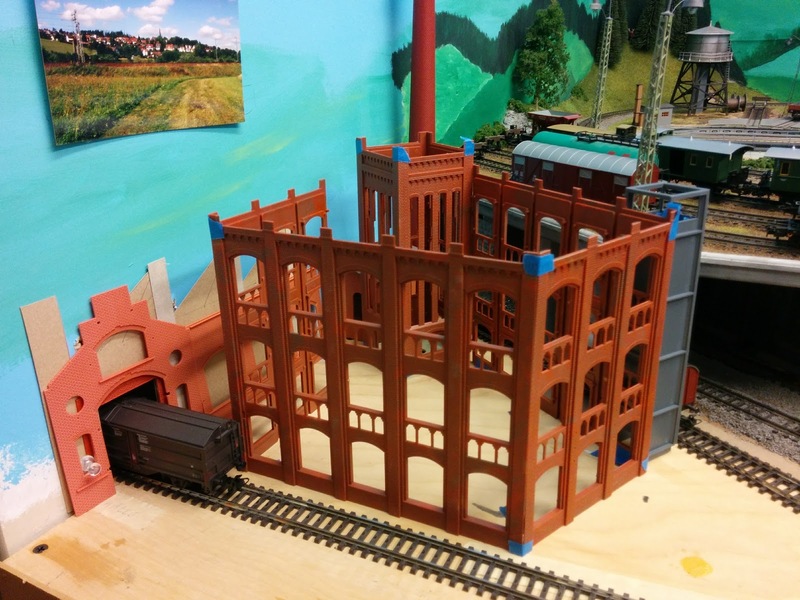 The large loading ramp will move from the rear to the aisle side of the building giving me an opportunity for lots of detailing work at some point in the future. 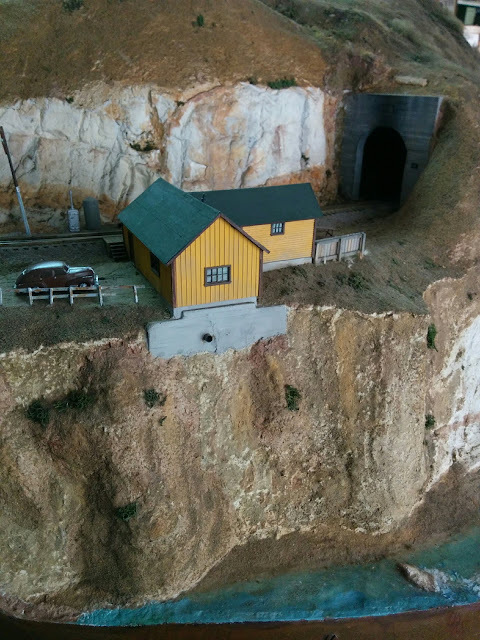 I'll keep the coal dump at the end of the rear track and kit bash the second building as half-relief from DPM parts and some parts from Faller's B-159 "Lokwerkstatt" kit, which has been sitting on a shelf for the last 25+ years. I like this new track arrangement. I flows better than earlier versions and the silo tower draws the eye away from the background. Huh! 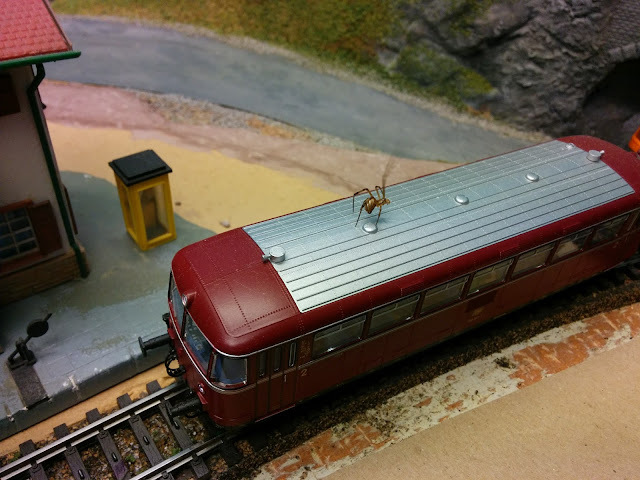 The rail bus picked up an unexpected passenger in the tunnel. The system for routing cars on the Welztalbahn keeps evolving. I started out with switchlists printed by the JMRI Operations module, and pretty quickly moved over to the MicroMark 4-cycle car card & waybill system. 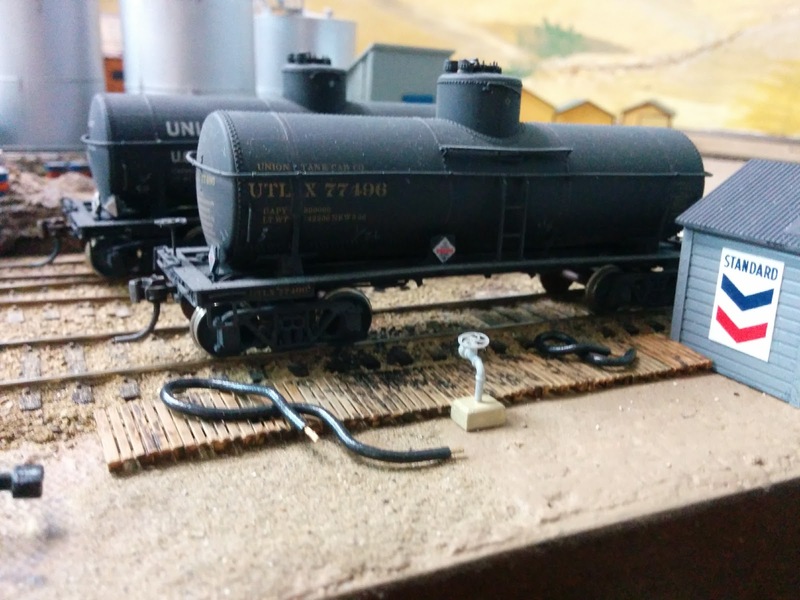 I used that successfully for several years and that's what I'm still using on the layout. 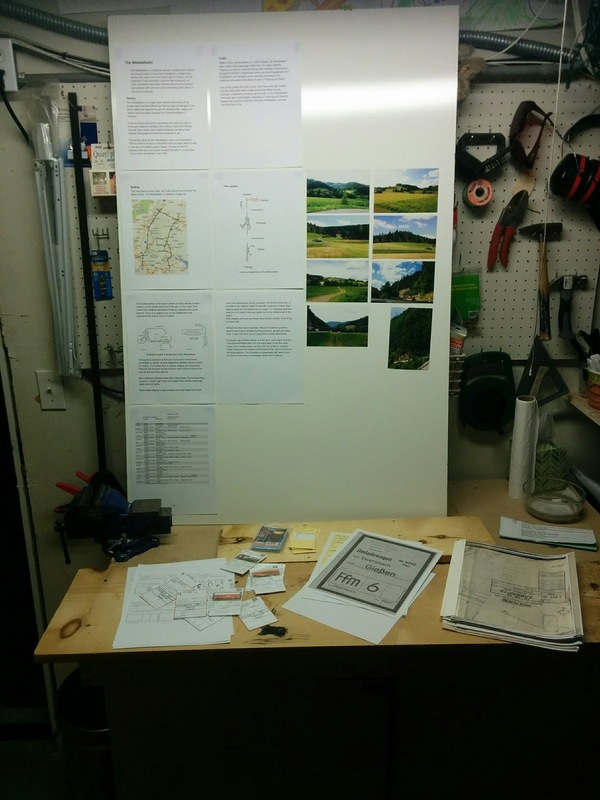 The latest iteration started off with inspiration from Tony Thompson and Tony Koester to more faithfully replicate the actual paperwork used on the prototype, mixed with ideas from FREMO, as well as some prototype paperwork images found on the Internet. 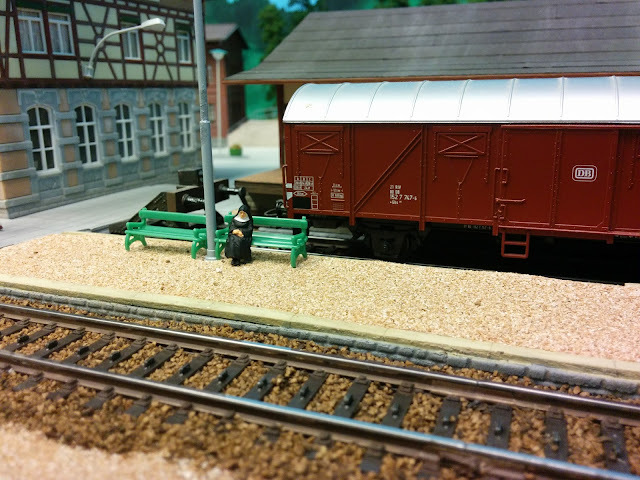 The topic of how railroad freight was routed in early 70's Germany consumed many hours of research mostly in online forums. 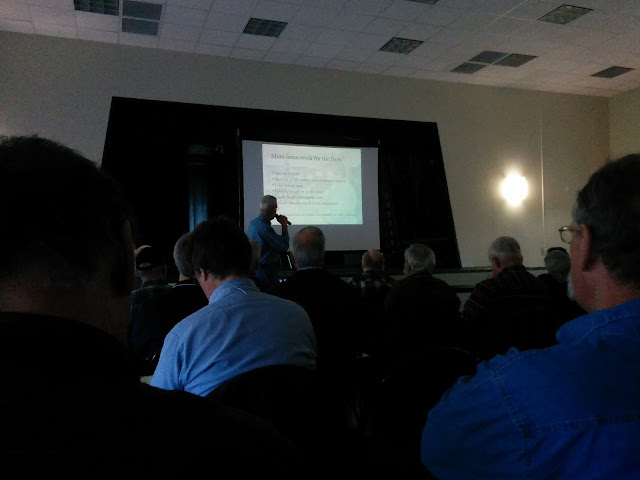 Talking to people that know how this stuff worked 40 years ago in person is a lot harder if you live 5000 miles away. Nevertheless, this topic became fascinating enough, that I bought more prototype paperwork extending the small collection I already have. Here and here are some good examples of what actual Hauptzettel looked like. A major change I made since my first discussion of this topic is that I put the era-appropriate routing number on the car card ("Richtpunktverfahren"), think of it like a postal routing code for the last yard before the destination. The system has changed multiple times, and the code in the 70's didn't look like what I photographed in the 80's. Here's a photo of a empty car card in the plastic sleeve. The sticker at the top has car number, car type, and exact car class (if known). 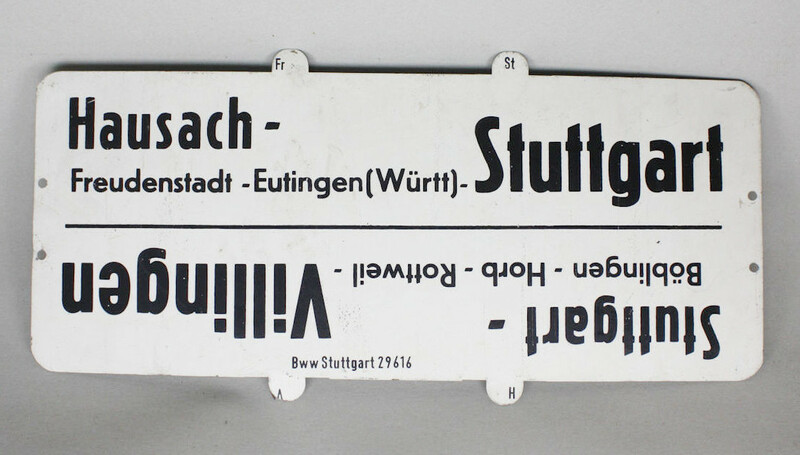 This the "Hauptzettel" (car card) for an empty car to be stored at a nearby freight yard. I don't know if there was a yard near Freiburg in the 70's and I don't know if the routing number is correct, but it's at least plausible: Freiburg belongs to the regional DB office ("Bundesbahndirektion") in Karlsruhe, and is not a major regional yard like Mannheim, so a two digit number is likely. On the reverse side is a sheet with compressed information about the car. The most useful for operators will be the photo, since European car identification are stenciled on cars in fairly small numbers. There is manufacturer, model, and coupler information. I replicate some of the prototype information like car length, weight, and maximum speed, and also include the respective values for the model. For added flavor I include the weight/speed table that's present on every car outlining how much freight the car may be loaded with. I collected this information from all active freight cars on the layout. Now I "just" need to design a few more blank car cards, print all info sheets, stickers, and car cards, fill them in, stick them into the respective sleeves, and we are ready to roll. 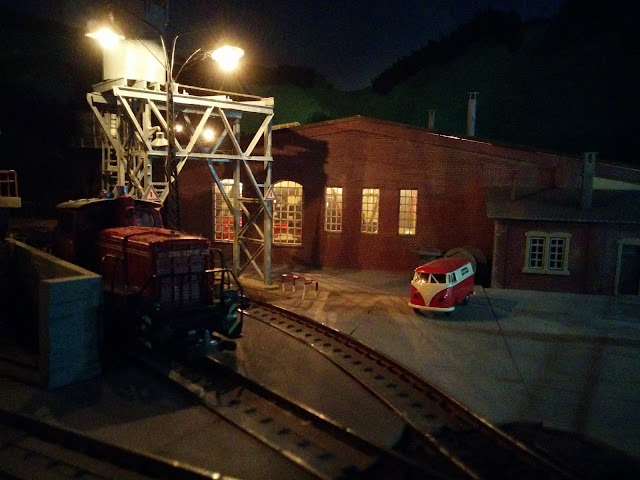 With all the rain this weekend, I spent quite a bit of time in the train room working with JMRI and my custom scripting to update the automated running machinery. I originally wanted to integrate with the newish dispatcher functionality built into the newer JMRI versions, but eventually gave up and just tweaked the script I've been using since JMRI 2.x days. My layout panel needs work to function properly with the Dispatcher module. JMRI on the layout computer needs updating, which implies updating Java, which implies updating Ubuntu, which in combination implies a giant time sink I didn't plan for. I will do that eventually, but not now. The scripting for automatic running is working properly now with 5 trains for some diversity, including opposing traffic on the single track main line. 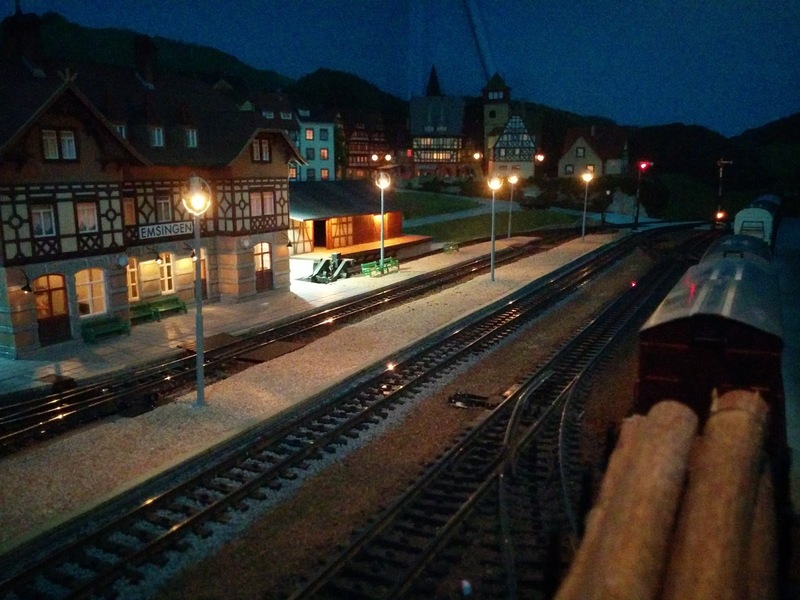 The platform lights in Emsingen are now powered up. 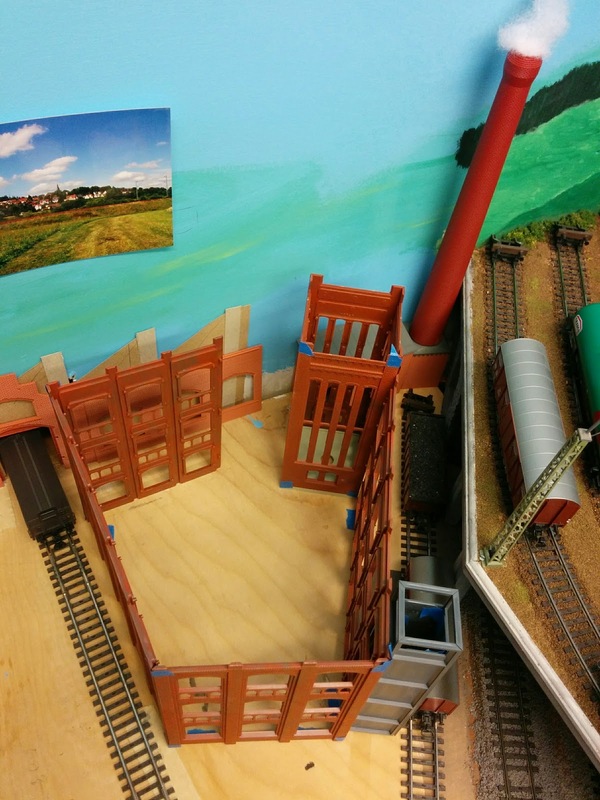 I need to add some passengers, plus workmen at the freight shed, and then the scene is mostly done. I really like the perspective and angle of the photo above, but the limits of the smart phone camera are painfully obvious. 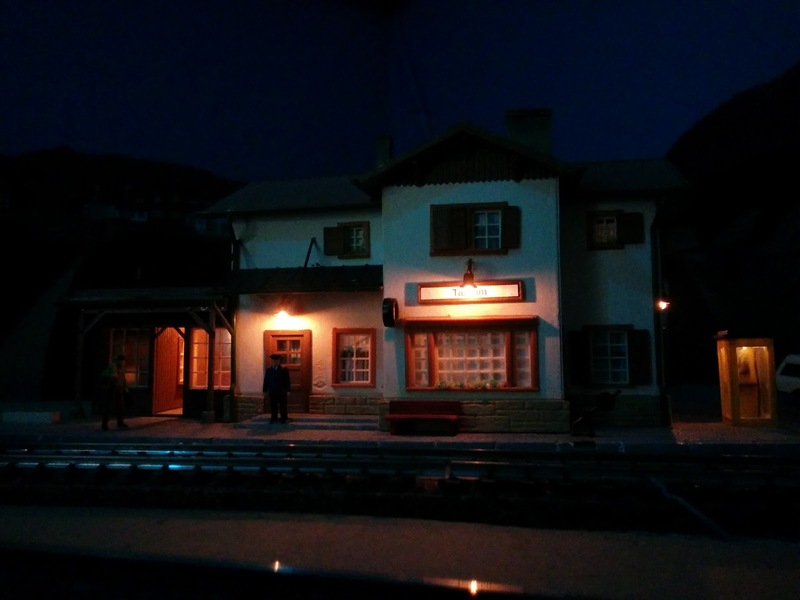 Taking proper night shots of the layout with the digital SLR camera remains on the to-do list. 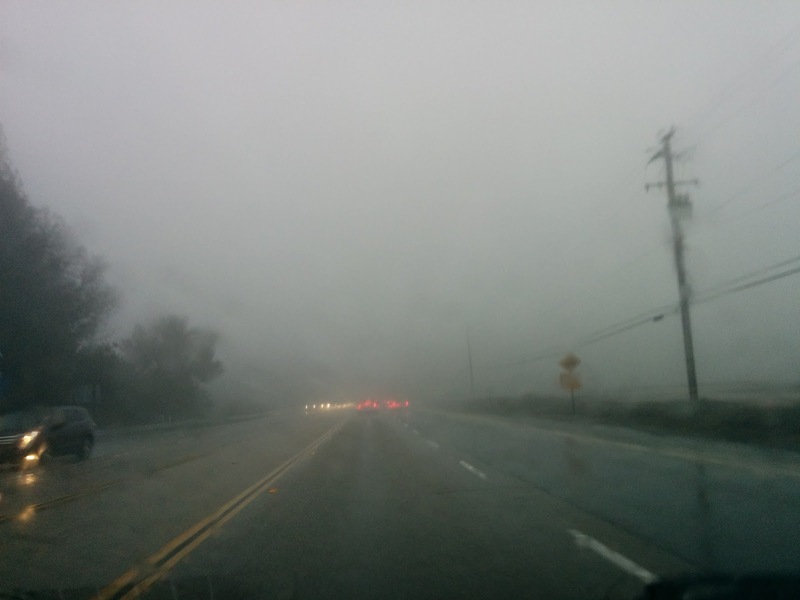 Well, the rain has come in real good now. Yesterday's freeway drive over the hill to Santa Cruz was a bit messy, and there were low-hanging clouds at the summit. Nevertheless, eldest daughter arrived safely at her college dorm, and I made it back in one piece, too. 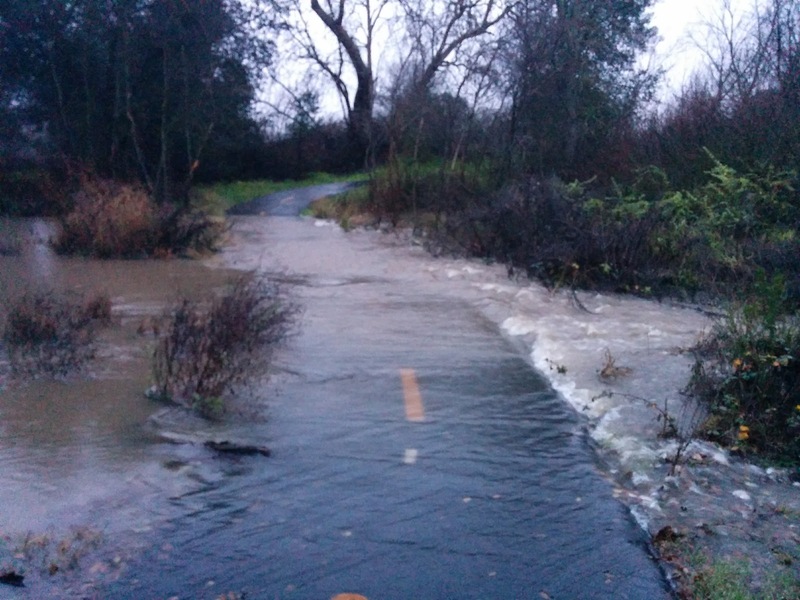 It rained nonstop this Sunday, various parts of San Jose and Morgan Hill are under flood advisory. Coyote Creek has started to flood the trail again. 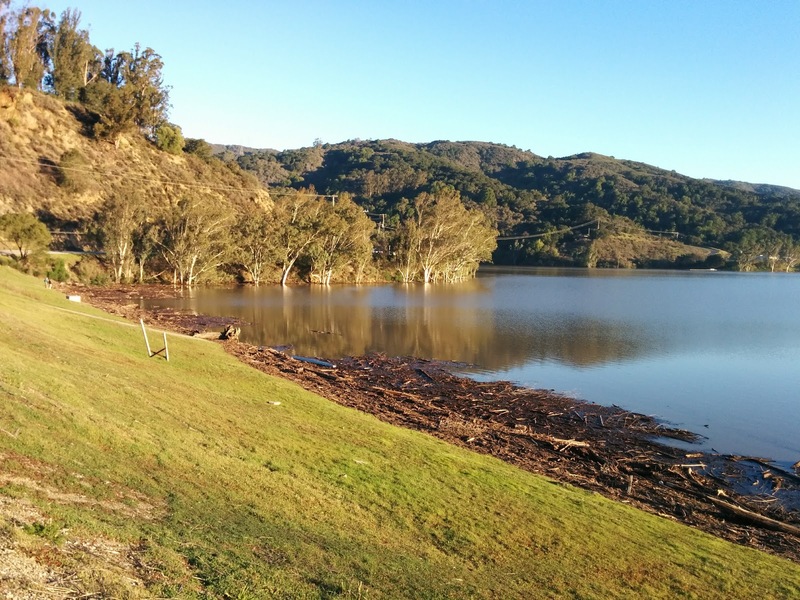 We're certainly getting some badly needed water. 6 o'clock on a cold Tuesday morning. This is it. The break is over. I took 3 months of personal leave from work, plus 2 weeks of vacation over the end of year holidays. 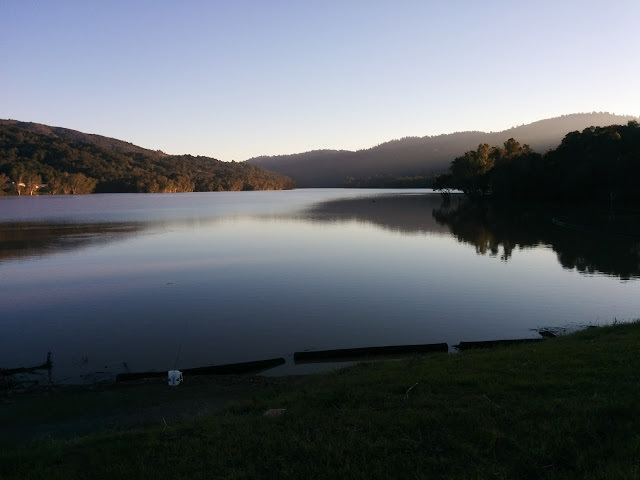 The intention was to disconnect from work, do some hobby projects, and recharge my batteries. 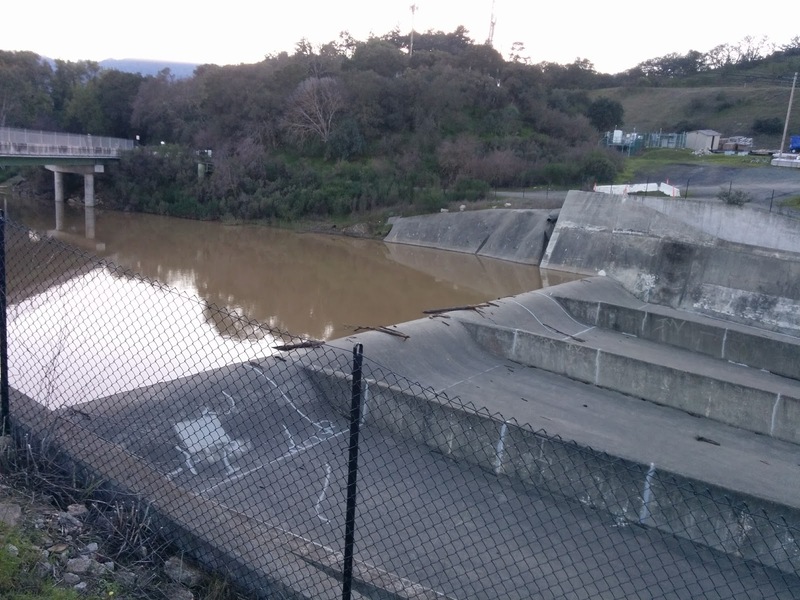 The Hallelujah paper mill at Silicon Valley Lines is operational and mostly scenicked. 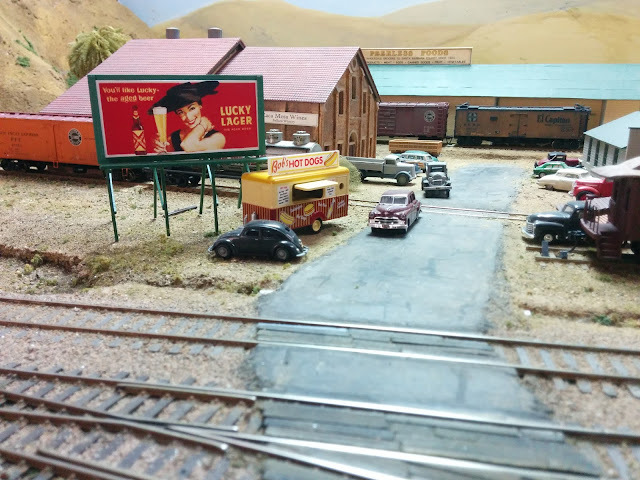 It's a lot more fun to operate an industry with buildings and recognizable loading areas, adding icing on the cake of a large operations-oriented layout. 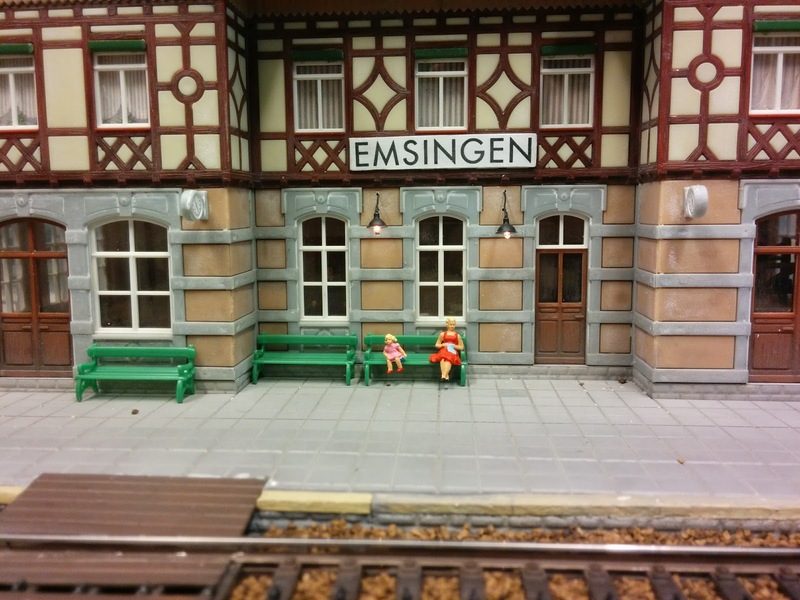 The Emsingen station area is finished on the street side, and very close on the track side, closing a large scenery gap on the Welztalbahn. I refined my techniques and gained confidence in what I'm doing. Both projects likely would not have happened (or much, much slower) if I had not been able to put in a solid 6-8 hours of model building, days at a time. Nevertheless, as these are scenery projects, there's always opportunity for further detailing and fine-tuning in the future. I threw in a trip to Germany to hang out with my parents for two weeks. While there, I did quite a bit of background research on the prototype Murrbahn, which is serving as inspiration for a future home layout. 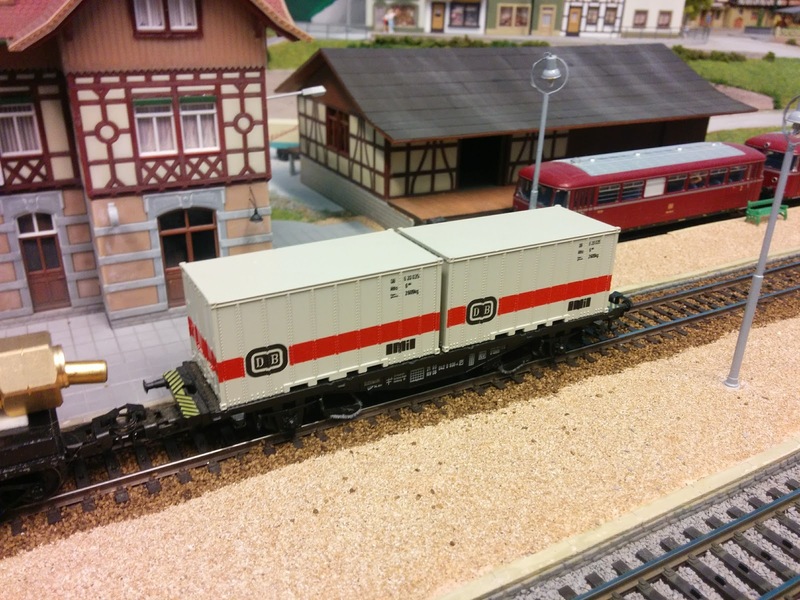 I learned how Deutsche Bundesbahn handled freight traffic in the early 70's. 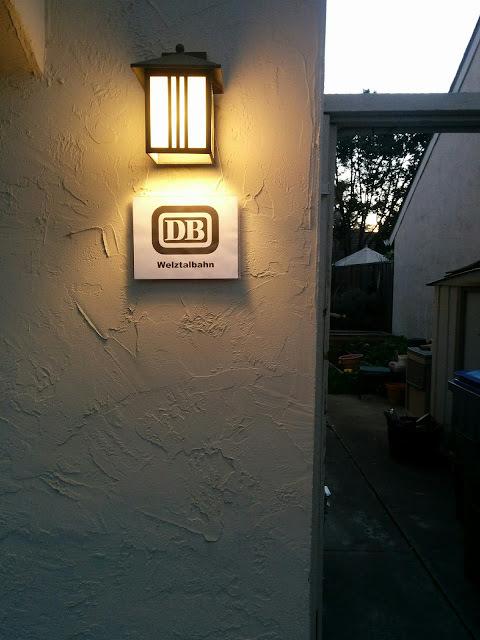 Visits to the Staatsarchiv Ludwigsburg, reading DB documents, and digging through the Drehscheibe Online historic forum proved to be particularly useful. Revised paperwork for the Welztalbahn made substantial progress. I'm grateful to have a supportive employer and managers that encouraged me to take the time off, with the knowledge that I have a job waiting when I return. Most importantly, the flexible schedule allowed me to go on almost daily walks with my wife, pick up the kids from school, and generally spend more time with family. I loved every minute of it. Along the way I discovered that I enjoy baking cake, and even built some furniture. It was tough going back into the office this morning. The warm welcome by co-workers and friends made up for it. I'm looking forward to my new assignment which is already proving to be challenging and fun. I'm prepping for an update of my automated running script, which requires that all track used by automated trains is serviced and working well. The Welztalbahn hasn't run for quite a while and especially the M-track in staging had issues with dirt, dust, and a bit corrosion. In the past WD-40 has always been useful in helping to resolve these. This time around I gave my Centerline cleaning car a workout too. 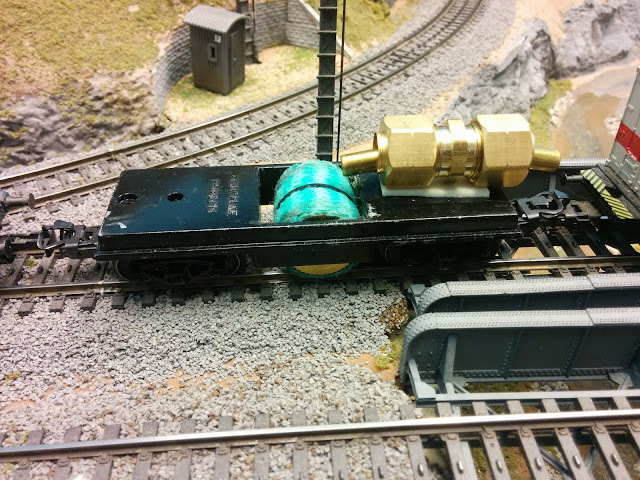 The cleaning train is pulled by 151 104 (Maerklin 3058), a very heavy 6-axle locomotive with powerful motor, excellent traction and power pickup. 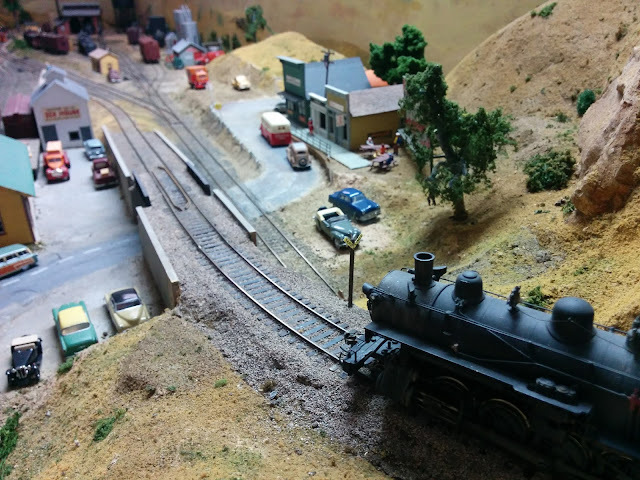 I weighed down the rear of the Centerline car to reduce the likelihood of the rear truck climbing up over the rails at turnouts that are thrown against the train, as is common in my staging tracks. Regular cars don't have any issues with this, but the cleaning roller is putting enough strain on the car that every bit helps to keep it on the rails. Bringing up the rear is a container flat car with two Noch "Reinigungszwerge" cleaning pads. I soak the roller of the cleaning car in 70% isopropyl alcohol. The roller is usually rubbing over the top of the rails and not rolling very much (that's good and intentional). The Noch cleaning pads provide some extra rubbing and pick up the alcohol. After a few rounds, the track is squeaky clean.